We are exploring the use of freshwater invertebrates to help remove unwanted resources from farm drainage water, including contaminants and nutrients. Our first focus is a native mussel, a snail, and oligochaete worms. 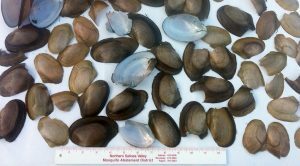 The California Floater Mussel filters organics and bacteria from water. It is severely limited in historical southern range, including Central CA. The larvae attach to fish before dropping to a desirable bottom. Since they attach to the non-native mosquito fish as well, we want to use mosquito fish, already widely used in mosquito abatement programs, to reintroduce the mussel locally and regionally. Invertebrates can be introduced to existing treatment ponds, into wood chip water filters, or developed into a mobile and modular treatment trailer that could be moved to treatment sites for short or long-term deployment. This work is done in partnership with the Central Coast Wetlands Group at MLML.